​Summer is back and with it comes a problem all dog owners fear: fleas. When it comes to owning a dog, these little bugs represent one of the most significant challenges you’ll face. After all, nobody likes watching his or her dog itch and be uncomfortable. Thankfully, some manufacturers have identified this problem and figured out ways to stop these little bugs from ruining your dog’s life. No longer do you have to watch in misery as your dog continually itches with the existence of products like flea collars. However, they’re so many of these products on the market these days that it’s hard to tell which one is the best flea collar for dogs. Honestly, most of them look the same and offer the same features/promises. Due to this, we felt it would be a good idea to provide you with a guide that discusses all you need to know about these products and goes over the best ones on the market. In the section below, you’ll find a detailed discussion of the best flea collars that’ll help you pick the right one for your pup. The goal here is to find the perfect flea collar for your dog’s particular needs. What is a Flea Collar for Dogs? As you’d expect from a product review section, this part of the article will discuss some of the most popular flea collars on the market: outlining key features, pros, and my thoughts on the overall product quality. 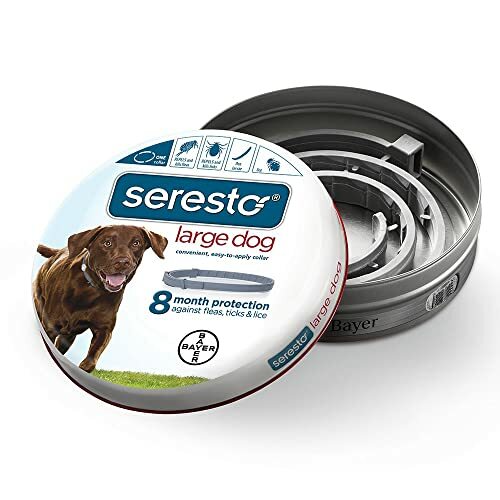 The first product on our list is the Bayer Animal Health Seresto Flea and Tick Collar, which is a treat & repel flea collar. Its ability to both treat and repel makes it an incredibly attractive option for me. See, I have a big backyard with many shady places where these little nasty things can hide and plot their attacks on my dog. Due to this, I need a flea collar that can offer a preventive measure against this incoming attack. But I’m sure some fleas have already made my dog’s fur their home; therefore, I need a flea collar that can also fight against already existing fleas. In this aspect, this flea collar fills both these necessary qualities to a tee. Along with this sense of covering all the bases, this flea collar is water resistant: something I need in any dog product I buy. My dog tends to explore wet areas at every opportunity. In a perfect world, his flea collar would be entirely waterproof, but given the materials, flea collars are made with, this isn’t realistic. Therefore, water-resistant will do just fine. Plus, the eight months of protection is a beautiful thing to have, especially, with my remarkable ability to leave things until the last possible moment. With this collar, I wouldn’t have to worry about replacing it or my dog getting fleas for a solid eight months. Honestly, the peace of mind this flea collar would give me might be worth the expensive price tag that comes with this product. But realistically, it’s a little too extravagant for my taste. Also, if your dog does have an allergic reaction to the collar, the results are rather severe. Not life threatening but hair loss and hives were present in numerous customers’ experiences. 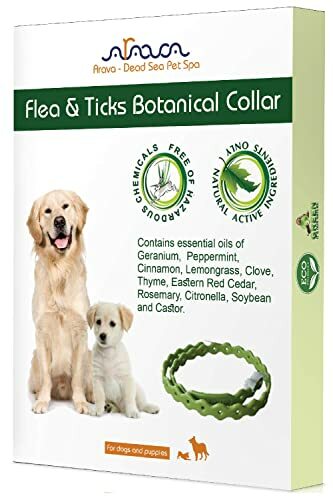 Although it’s the best rated flea collar on Amazon, this flea collar isn’t something I’d purchase for two reasons: the price and the severe allergic reactions. However, if you’re okay with the cost, consult a vet before deciding not to buy one of these collars. After all, these allergic reactions might be isolated incidents or caused by the owners misusing the flea collar. And given the flood of positive experiences with this flea collar, I’d give this product an immense amount of consideration: if I didn't care about the price. 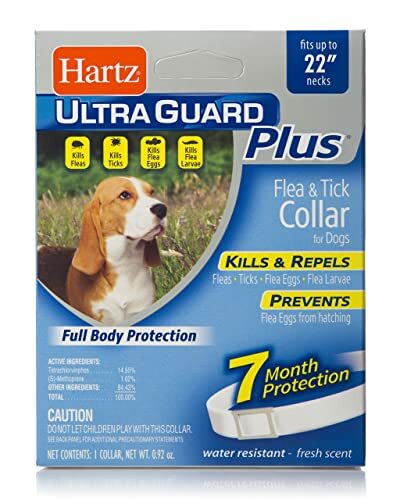 The first thing you’ll notice about the HARTZ Ultraguard Plus Flea & Tick Collar is the incredibly low price. I’m always on the lookout for a bargain, so, this product gained my attention from the very beginning. Then, I was taken aback by the fact it was a treat & repel flea collar. As mentioned before, this type of flea collar is essential to my dog’s particular needs. And with further research into the product, I kept uncovering features that would be perfect for my dog. For example, it has a promise of seven months of protection, water-resistance, fits neck sizes up to 22 inches, etc. However, all these positives were shut down by two elements that kept popping up in numerous customers’ experiences. These two things were a common trend of complaints about the flea collar’s effectiveness and a lack of customer service. Now, this isn’t to say there weren’t many people expressing positive experiences using this collar: there was. But the mixture of numerous negative experiences about the collar’s effectiveness with a reputation for having bad customer service isn’t something I find remotely appealing. Due to this mixture, I’d find it hard to justify purchasing this flea collar even at its incredible price. In fact, I wonder whether or not they use the low cost to draw people in and take their money. Overall, this collar has many features I’d consider necessary in any flea collar I purchase. But the flaws in this product make this an unsuitable item to enter my dog’s life. Nonetheless, if you’re on a budget and need a flea collar, this one might be the perfect option for you. Again, there are plenty of people who swear by its effectiveness; maybe you’ll end up being one of them. Our first repelling flea collar on the list is the Arava Flea & Tick Prevention Collar. This collar has a unique feature that stands out from the most of the others on this list: it’s use of 100% natural ingredients. This determination to use completely natural ingredients is something I love about this flea collar. It ensures there will be no chemical allergic reaction to the toxic ingredients usually found in flea collars. Additionally, the five months of protection gives me a nice feeling of comfort regarding the product’s overall effectiveness. It might not be as long as 7 or 8 months, but it’s still long enough where I don’t feel like I’m regularly spending money on ordering replacements. Furthermore, the idea of the manufacturer offering a refund is another thing I like to see when buying a product. Even in the case of a 30-day refund, it conveys the company’s willingness to stand behind their product. It makes me more willing to consider the fact these natural ingredients are as effective as the toxic ones found in other flea collars. After all, the would be a welcome change considering that nobody likes exposing their dog to these chemicals. However, there are a couple of things about this product that I can’t accept. First, the cost. I assume this price comes from the use of natural ingredients being more expensive than using toxic ones. But even so, I can’t wrap my head around paying this much for a simple flea collar. Secondly, there's no way I can choose a flea collar that isn’t a treat & repel one for my dog. Its become evident that he already has some fleas in his fur. He scratches and itches far too much for anything else to be considered. Honestly, I’d love to purchase this flea collar for my dog. But it’s not a good fit for his particular needs. And no matter how much I loathe trusting these companies with these toxic ingredients, I can’t afford to shell out this amount of money for a repelling flea collar. It’s a shame too because I admire what Arava’s trying to accomplish. And from the looks of it, they’re well onto their way to offering a high-quality, natural ingredient that rivals the toxic chemical ones. 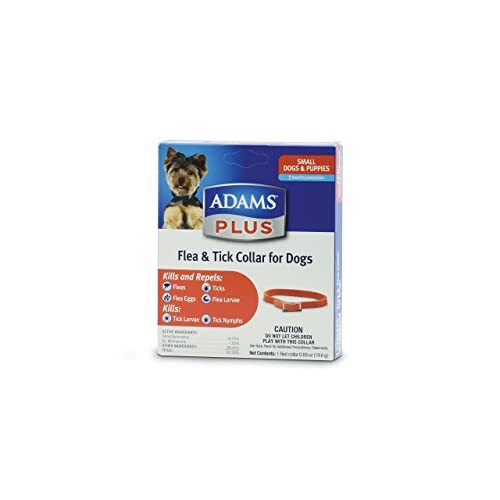 The Adams Plus Flea Tick Collar is a standard, run of the mill treat & repel collar with all the expected features. However, what makes this collar such a popular product is its bargain-level price. At this price, you don’t expect a promise that ensures seven months of protection or the ability to both repel and kill fleas. With these two features, I was entirely on board with buying this product. Plus, you throw in water-resistance, and I was sold. But then I found out why this product has such a low price. See, the collar gives off a very unpleasant and strong odor detectable to humans. In uncovering this, I had to reexamine whether or not this smell was something I’d want inside my house. And given the low price, I think it’s something I could get used to, but it’s less than ideal. Moreover, the flea collar’s flimsy design is another negative that comes with this product. It seems the collar has a tendency to end up broken or destroyed rather quickly. But the poor design isn’t a vastly detrimental problem for this particular collar, as I could afford to buy multiple. Overall, the flaws don’t contradict the positives enough to make this product a non-buy for me. While this product’s flaws aren’t ideal, they aren’t deal breakers. In other words, they’re something I could learn to live with and maneuver around. There’s nothing too detrimental for me to make this product unworthy of my consideration. And given it checks off many of the necessary features I’m looking for in a flea collar, I’d strongly consider investing some money into buying a couple of these collars. They’re easily the best bargain on this list. Due to this, if you’re looking for the highest quality for the lowest cost, this is the collar for you. But if you have a strong sense of smell or get incredibly bothered by things breaking, it’s a smart idea to look elsewhere. 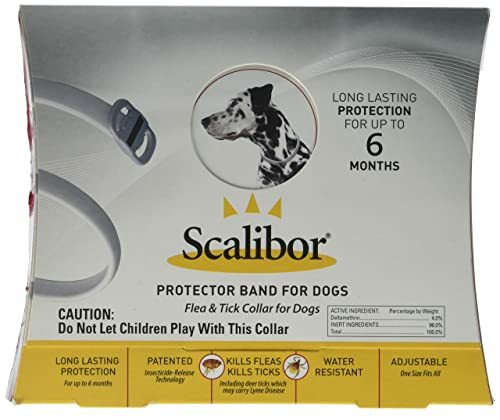 As a treatment flea collar, the Scalibor Protector Band makes sure to eradicate any existing fleas from your dog’s fur. This demolition of fleas is something I love about this product. Additionally, any long-term promise of flea protection is a nice bonus for a flea collar. In this case, six months offers me ample time to plan my next move regarding whether or not the products needs replacing. Otherwise, this flea collar seems pretty standard in its features: one size fits all collar, water-resistant, can be worn by dogs over 12 weeks old, etc. Scalibor covers all the bases with this treatment collar. But there lies my problem; a treatment collar won’t help my circumstances. Unless I want my dog to wear one all year round, I can’t see myself buying one of this type of flea collar. Realistically, my dog doesn’t need one of these collars because the environment around him guarantees that without a repelling element he’s going to end up with fleas. It would end up being a waste of money. Honestly, there are too many interactions with my other pets for a treatment collar to work effectively. Then, you add in all the other wildlife around him in the backyard, and there’s no way these collars could be the end-all solution. Besides not fitting my dog’s needs, the outrageous pricing doesn’t help this flea collar’s case. You’d imagine with this high of a price that they would've added in a repelling element. But alas, they didn’t think it was necessary, I guess. Quite simply, this Scalibor’s flea collar doesn’t fit the requirements I seek in a flea collar. Not saying this product doesn’t have its merit, but me, it leaves a lot to be desired. However, if your dog does have an existing flea infestation, this product should be among the flea collars you consider. Its customer base has demonstrated their happiness with this flea collar’s effectiveness in getting rid of this issue quickly. 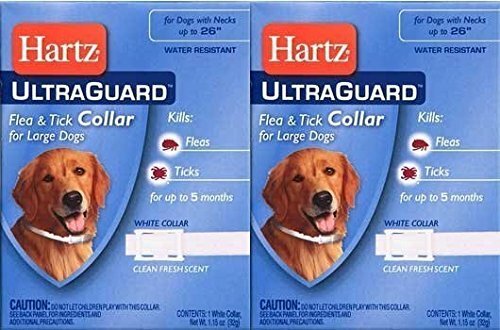 In terms of price per flea collar, the Ultraguard Flea and Tick Large Dog Collar is the cheapest product on this list. It accomplishes this through its two-pack deal for the price of what it would take to buy most of the other items in this article. Putting aside my issues with treatment flea collars, this collar does have some benefits that it offers: water-resistant, multiple month flea protection, fits neck sizes up to 28 inches, etc. In these aspects, this product has all the necessary qualities of being useful for someone seeking a treatment flea collar. You think it’s a bargain until you start hearing about its flaws. For example, it’s not odorless, which is a bummer. Now, if this was a treat & repel collar, as I previously mentioned, I could see myself dealing with a flea collar with an odor. But this isn’t; therefore, there’s no shot I plan on buying this product. Unfortunately, the flaws get frightening from here; some dogs have extreme reactions to the chemicals used in this collar. For instance, boils, hives, and blisters have been contracted because of this flea collars use. In light of these reports, there’s no way I’m putting this collar around my dog’s neck. I don’t care about the price being this low; I value my dog’s health over everything else. These circumstances aren’t giving me confidence in this product keeping my dog safe. Even if this product were a treat & repel flea collar, the safety concerns would be enough to make sure I never bought it. At some point, you reach a limit on how much you’re willing to put up with for a bargain price. In this case, a threat to my dog’s safety was the last straw. Typically, I try to think of a circumstance where the product I’m reviewing would be useful, but for this flea collar, there is none. 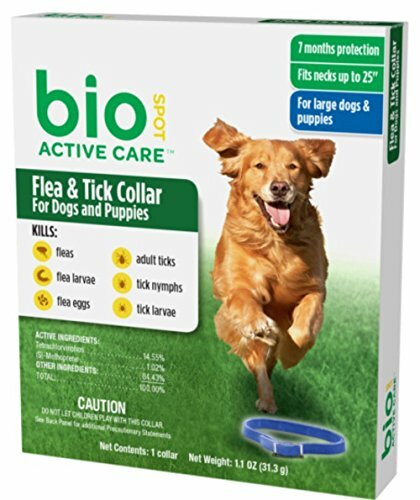 The BioSpot Active Care Flea and Tick Collar isn’t a unique treatment flea collar by any stretch of the imagination. But it has everything one could expect from a high-quality one. As you would expect by now, flea protection, it being suitable for dogs over six weeks old, neck size up 25 inches, and water-resistance are just some of the things this collar provides. Due to this, I would feel completely safe having my dog with this collar around his neck. It’s an unspectacular, effective option that people will overlook because it doesn’t offer any special or unique features. In other words, it doesn’t try to do anything extra and sticks with the task at hand: killing those fleas as efficiently and quickly as possible. But for me personally, it falls flat because it doesn’t fit the type of flea collar I need. It’s not something I would consider because it doesn’t offer a feature I desperately need in any flea collar I end up getting: a proven repellent against fleas. Regardless of my personal preferences, this flea collar is on this list because it will get the job done without causing too much of a fuss or endangering your dog. Honestly, within the pet consumer market, that’s all you can ask for in a product. All in all, BioSpot did an excellent job of creating a flea collar that will do its job efficiently and without a tragic incident. Due to this, if you’re in the market for a treatment flea collar, this product should be at the top of your list. Once you buy one of these collars, you won’t have to worry about your dog’s flea problem much longer. And isn’t that the whole point of buying ones of these things anyway? Fleas collars are specially designed to protect your dog from the horrors provide by fleas. Generally, you make a flea collar by mixing flea-killing chemicals with plastic and molding them into a thin strip. The result is a product that intends to give dog owners a sense of comfort through protecting their dog from ailments caused by fleas like hot spots, scratching and other nuisances. In an ideal scenario, a flea collar is a preventive measure rather than a treatment. See, it’s always better to stop something before it starts rather than fixing it later. You want to end the flood before the water even reaches the outer limits. Therefore, the idea behind these collars is to provide a defense against the fleas before they start making your dog’s life a living hell. Of course, this doesn’t mean there aren’t types that are effective in killing the fleas after infestation. Regardless of your dog’s flea scenario, flea collars are a worthwhile option to consider. They’re a practical, quick solution to a problem that has haunted dogs for ages. Don’t let your dog become miserable with the affliction of constant scratching. There are three types of flea collars: repelling, treatment, and treat & repel flea collars. Each type has a specific function regarding how they deal with the flea problem. Below, we’ll discuss the differences and their methods of getting rid of these awful bugs. These flea collars have one job: repelling the fleas before they even get into your dog’s fur. They have one goal and try to accomplish it by emitting a gas that fleas find revolting. As a result, the fleas will hopefully ignore your dog. Therefore, these collars try to get rid of the fleas before they become a problem. But in the effort to this goal, these collars offer no sense of treatment against already existing flea problems. In light of this, if your dog has already existing flea issues, these collars aren’t the right ones for you. The two options below are going to fall more in line with your dog’s particular needs. Mainly, these collars are the nuclear option for dog owners who anticipate fleas will be a future problem for their dog. For example, a dog owner living in a woodsy environment should consider these collars as an option. Treatment flea collars are for the poor dogs that already have a flea infestation making their lives miserable. These collars “treat” the condition rather than preventing it from happening in the first place. In doing so, they’re two ways these collars achieve this goal: medication that seeps into your dog’s skin or active ingredients that spread using your dog’s natural oils. Either way will work to remove the horrifying sense of constant itching from your dog’s life. Unlike the repelling flea collars, these collars make sure to kill the fleas rather than making them ignore your dog. Due to this, these collars are often advertised with words like “treat” or “cure” somewhere on their box. Overall, these collars are a way to get rid of an already existing problem through eliminating the threat. If your dog has fleas, these collars are an option you need to consider. Treat & repel flea collars combine the desired effects from the two before mentioned types into one product. In doing so, you can expect them to have high prices but the most effective results among flea collars. By combining the uses of both the other types, you can confidently use these collars in any situation with fleas. Whether fleas have already burrowed themselves into your dog’s fur or not, these collars will help alleviate the issue. Due to the multifaceted use, these are the collars I’d recommend. But the high cost does put a burden on the wallet. So, if you aren’t looking to pay an arm and a leg for a flea collar, you might want to look into the two other types. After all, a flea isn’t supposed to be a long-term replacement for a regular collar; therefore, the higher price of these collars can seem a little extravagant. But personally, these collars’ effectiveness make the price not a big deal for me. Since there are three different types of flea collars, this section is split into three parts. Each part will discuss how each particular type works to rid your dog of the nightmare effects caused by fleas. Repelling flea collars are relatively simple; they emit a gas that makes your dog unappealing to fleas. Due to this, fleas will avoid invading your dog’s fur. Ideally, these collars are a preventative measure to ensure your dog never has a flea problem. But this action of only “repelling” fleas leaves a lot to be desired for most dog owners. Let’s be honest; I don’t expect most dog owners to be forward thinking about their dog having a potential flea problem. In fact, I’d expect most dog owners don’t think about fleas until they start becoming a noticeable problem. After all, it’s human nature to wait until the last minute to address a potential issue. So, if you’re like me and wait until the last minute, repelling flea collars are probably aren’t a smart idea because it will do nothing to cure a flea infestation. And as a procrastinator, I likely won’t do anything to prevent an issue before it becomes an issue. Treatment flea collars work quite a bit different than repelling flea collars. See, these collars are meant to combat an ongoing infestation of fleas. In doing so, they’re very aggressive in addressing the problem. With this aggressive approach, these collars rely on medication that drips into your dog’s skin or chemicals that spread throughout your dog’s body in their natural oils. Both are extremely effective in eliminating those fleas from your dog’s fur. But, as you would expect, this isn’t a collar you want to use in a preventative manner because you’re dealing with chemicals. For example, these collars are designed to kill the fleas either when they bite or on the first contact with your dog’s skin. In other words, their use should be reserved for circumstances involving a very aggressive flea infestation. There’s no reason to use these collars in preparation for flea season because their aggressiveness is more likely to activate the flea collar’s side effects. As the most effective type of flea collar, the treat & repel collars combine the beneficial aspects of the other two types into one product. How they mix the two varies from collar to collar. Regardless of the method, each one of these collars has the goal of being able to handle any flea situation imaginable. However, it’s crucial you find the one you’re comfortable in using. If you’re wondering how to tell the difference between the types of flea collars, an easy way to know is how they advertise the product. For example, the treat & repel flea collars will have words like “kill “or “eliminate” on the box. Phrases like “kill the fleas and their larvae” are commonly seen on these products. In comparison, repelling collars will use lighter toned words like “repel” or “ignore.” And as previously stated, treatment collars will use words like “treat” or “cure.” In the end, it’s really about picking the right type for your dog’s situation. Given the widespread usage of flea collars among pet owners, it shouldn’t come as any surprise that they provide your pup/you with numerous benefits. In this section, we’ll go over some of those benefits and explain how they might help better your dog’s life. With the use of a flea collar, you limit the risk of exposing your dog to flea saliva, which causes allergies, scratching, and itching. In doing so, you’re avoiding the ailments that come from excessive scratchings such as hot spots and skin infections. In comparison to the other flea prevention products, flea collars are on the low side of the spectrum regarding their price. Therefore, if you get a high-quality one, they represent quite a bargain. Along with being less expensive, flea collars offer the most extended sense of protection among flea killing products. In fact, some even offer up to 12 months of stability before they need replacing. Fleas have the nasty habit of sometimes carrying and transmitting tapeworms. If you don’t know, a tapeworm can cause your dog’s stomach to become upset. And in puppies can make them suffer from anemia, slow their growth, and cause intestinal blockage. If your dog doesn't have fleas, there’s no risk of your home becoming flooded with them. And since it’s rather unhealthy living with fleas, this is a benefit that betters both your and your dog’s life. As you might expect, a flea collar’s effectiveness will vary from product to product. But with a high-quality one, there’s no reason to suspect it won’t be completely effective in providing your dog with a flea-free life. In fact, while other flea related products might be more convenient, these flea collar can offer longer lasting results with some even saying they can provide up to 12 months of flea protection. Overall, it’s all about making sure you choose the right product for your dog’s circumstances. And ensuring the product you do want is a proven high-quality, flea-killing product. As a consumer, you need to know what you want in a product before deciding what to buy. Therefore, this section will discuss the things you need to consider before choosing the best flea collar for your dog. When buying a flea collar, the first thing you need to understand is your dog’s flea situation. You need to know whether you want to prepare, treat, or both before deciding on the right flea collar. After all, knowing this will make it much easier to navigate the flea collar market. It will give you an idea of the exact model you want to buy. For example, if you have a backyard with a lot of shaded areas, places fleas love to hide, then preparing beforehand might be the option for you. In this case, a repelling or repel & treat flea collar would be the right type for your particular needs. On the other hand, if your dog already has severe flea issues, a treatment or repel & treat flea collar would most likely be the most appropriate option. Honestly, understanding the type you want to buy makes the process much less time-consuming. Like any collar for your dog, you need a collar that is water resistant. It’s essential to obtaining the best possible experience with a flea collar. You don’t want to spend a lot of money on a flea collar and find out that it can’t handle a little rainstorm. And honestly, most dogs love water. Why would you buy a product that prohibits them from exploring things they love? It doesn’t make sense logically or money wise. So, make sure the flea collar you buy is water resistant for both you and your dog’s benefit. Since we’re dealing with products that use toxic chemicals, you need to thoroughly research the ingredients inside the flea collars you’re considering. It’s imperative you make sure the chemicals inside the collar are safe for both humans and dogs. After all, some manufacturers don’t care about your pets and cut corners to make more money. And your research into the chemicals will help you avoid buying from these awful companies. For some reason, flea collar manufactures thought it’d be a good idea to create them with a strong odor. But I can tell you this wasn’t a good idea because most of the time the smell is incredibly pungent. With this in mind, please make sure to buy an odorless collar. Don’t be the owner who throws out a collar because of an entirely unneeded feature like having an odor. It will become a waste of your money and time. How long a flea collar last varies: some last one-month, others can last up to eight months. Therefore, it’s essential you take the time to figure out the right length of time for your dog’s needs. If you’re overly concerned and hate the idea of replacing the flea collar every month, instead buy a flea collar that works for eight months. In this case, it’s a more convenient option for this type of owner. In comparison, if you need a flea collar for a short period, there’s no reason for you to spend more money on a flea collar that offers a more extended protection period. In the end, it’s about what is right for you and your dog’s circumstances. You’d be surprised how many dog flea collar reviews mention that the product didn’t fit their dog. And most of the time, there was a simple solution to this issue; reading the size chart and measuring your dog’s neck. In light of this, make sure you adhere to the manufactures size chart and correctly measure your dog’s neck. Honestly, the size chart is there to make your life easier. So, please allow it to do its job. In this section, we’ll answer some of the questions that will inevitably come up in your search to find the best flea collar for dogs. Hopefully, it will make your decision about which flea collar you want much easier. In most circumstances, flea collars are a very safe product, as long as; you don’t allow your dog to chew on them. In other words, if you read the instructions, you shouldn’t have any problems. But if you have multiple dogs, it’s essential you make sure you don’t allow the other dogs to chew on the flea collar during play accidentally. It could cause them to get poisoned or have some serious neurological problems. Additionally, some side effects come along with flea collar use. These side effects are considered minimal; however, they include hair loss, scratching, and redness. Do flea collars make dogs sick? If used correctly, there is no reason why a flea collar should make a dog sick. However, the chemicals in the collar are toxic and can cause severe issues when ingested such as poisoning and neurological deficits. Therefore, make sure your dog doesn’t chew on any flea collar to avoid these harmful issues from hurting your dog. And if they do chew the flea collar, it’s essential you know the signs of flea collar poisoning. Most likely, these chemicals are or similar to amitraz or propoxur. This site did an excellent job of outlining the signs of flea collar poisoning, so, you can prepare for this nightmarish scenario. The majority of the time a flea collar will be entirely safe for your dog’s particular circumstances. However, there are some scenarios where flea collars aren’t suitable for use. For instance, flea collars aren’t meant for pregnant, senior, or nursing dogs. In each of these cases, there are specific detrimental issues that make the use of a flea collar problematic. Due to this, make sure you consult with a vet before purchasing a flea collar for your dog. By doing so, you’re making sure there isn’t a potential health issue that could arise from the flea collar’s use. Can dogs swim (bath) while wearing the collar? It depends on the collar. Some are entirely safe for dogs to wear in the water but others aren’t. Regardless, it’s a good idea to remove them before your dog goes in the water because flea collars are rarely completely waterproof. See, many flea collars will start wearing down after constant exposure to water. Due to this, removing them before bathing or other water-based activities will reduce the risk of the collar wearing down. However, the best flea and tick collars for dogs will be water resistant because it doesn’t limit what your dog can do. If your dog does accidentally enter the water with their flea collar, it won’t mean you have to buy a new one. After all, dogs are very mischievous and often end up doing the very thing we tell them not to do. Therefore, it’s essential you seek out a water-resistant collar to protect not only your dog, but also your wallet. - Other than Flea Collars, How can I Prevent/Get Rid of Fleas and Ticks on my Dogs? Among dog owners, flea collars are a popular choice to fight against the plague that fleas represent. However, these collars aren’t the only product on the market that act as flea control for dogs. Other products include spot-on treatments, oral medications, shampoos, tick dips, powders, tick sprays, etc. Each one of these items is explicitly made to fight these annoying little nuisances. If you want to learn more about these options, PetMD does an excellent job going over each one of these options and more in this article. As we all know, fleas are tricky little things. Hopefully, with all this new information, you’ll be able to fight back against their planned assault on your dog’s fur. In fact, you now have an avenue, flea collars, to gain the upper hand. So, please use the information in this article to decide whether or not this avenue is worthwhile for your particular dog’s circumstances. After all, if you do decide a flea collar fits your dog situation best, you can feel confident knowing that you have all information needed to successfully pick out the best flea collar for dogs your money could buy!